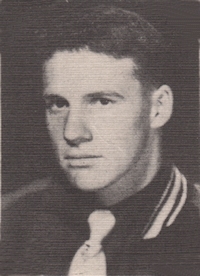 Obituary – Campbell, Delmar Thad « Perry High School Alumni Association, Inc.
﻿Football 46-50, Football Co—Captain 49-50, Perryscope Staff 49-50, Basketball 46-50. Services for Delmar “Daddy-O” Campbell, 67, will be at 11 a.m. Thursday at First Christian Church (Healdton, OK) with the Revs. Russell Cheatham and Richard Pitt officiating. Interment will be at Mount Olive Cemetery under the direction of Reser Funeral Home. Campbell died Feb. 9, 1999, in the local hospital after a sudden illness. He was born Jan. 26, 1932, in Oilton, to Lonnie L. and Elsie Wooden Campbell. A 1950 graduate of Perry High School, he joined the 45th Division of Oklahoma National Guard and served with them in Korea. After his discharge, he worked for Magnolia Oil Co., now Mobil Oil Co., and retired June 1, 1992, after 40 years of service. He and Faye Blaney were married Dec. 20, 1952, at Chandler. He was a member of First Christian Church, and was named “Bulldog Fan of the Year” 1994-95. Survivors include his wife, of the home; two sons, Clayton, Ada, and Danny, Healdton; two sisters, Clara Benton, Las Vegas, Nev., and Ada Pricer, Chandler; and six grandchildren. Bearers will be Clyde Hayes, Cecil Bruner, Teddy Warren, L.T. Martin, Bill Wilson and George Coffman. Honorary bearers are Foy Beshears, Clem Higgs, Alan Miller, Lavell and Kevin Engle, Terry Dodge and Mobil employees.